HUTCHINSON — Two for two. It took on so many meanings for Sabetha in Saturday’s Class 3A state championship game in Hutchinson. With the game on the line, the Bluejays opted against a game-tying PAT kick in overtime, down 42-41 to Pratt after Gabe Garber hit Ryan Stapleton for a 6-yard touchdown to answer Pratt’s overtime touchdown. Instead, Sabetha coach Garrett Michal put the game in Garber’s hands, going for a two-point conversion attempt and the win. "All six of us (coaches) said we were going for two and we had the same play in mind," Michael said. "He could have thrown it and he had that play early in the series and missed it. It's an RPO (run-pass option) and you have to cover it and if not, he can run it. It's not anything I do, it's the Jimmys and Joes not Xs and Os." Garber kept on a roll to the right and bore down on the corner of the end zone. Standing in his way was Pratt standout Travis Theis, who was closing hard. The two met at the goal line with Garber just able to sneak the ball inside the pylon to give Sabetha the 43-42 win. The title was the Bluejays’ second straight 3A championship, coming on the heels of last year’s 7-6 win over Marysville. “I know that’s the guy I want the ball in his hands,” Michael said. "He reached the ball over just before the pylon. I had a good angle and I thought he did." As he took off for the corner of the end zone, Garber had no doubt he was going to make it. The closer he got, the more the gap closed as Theis came charging hard. "I saw an opening and I went for it," Garber said. "I thought it was going to be much easier, but he came flying in at it me. I was just thinking to myself, 'Make it to the pylon and it's good.'" The two-point conversion capped a 13-0 season for Sabetha, while Pratt finished the year 12-1 and inches away from its second state title in three years. "It was a really good high school football game and it stinks to come out on the losing end of it," Pratt coach Jamie Cruce said. "You feel bad for the seniors who go out on a down note, but they have a lot to be proud of. "It was one of those things that we knew that whoever played defense first (in overtime) was probably going to go for two and the win. We really wanted to play D first, but that's not how it worked out. They did a good job and our kids played a great game as well. It was a tough ending, a game of inches." The inches that separated Pratt from a state title were about the only Theis wasn’t able to successfully cover in the contest. Slowed early by a stout Sabetha defense, once Theis got going in Saturday’s game he was unstoppable. Theis was a one-man wrecking machine, rushing for 245 yards and five touchdowns and throwing for 143 yards and another score. His 54-yard touchdown pass to Caden Blankenship to start the second half got the Greenbacks going and one possession later he broke numerous tackles on his way to a jaw-dropping 62-yard touchdown run that completely erased what at one point has been an 18-0 Sabetha lead and put Pratt up 21-18. "When you've got a kid like Theis, you know he's not going to go away," Michael said. "He's a great football player." 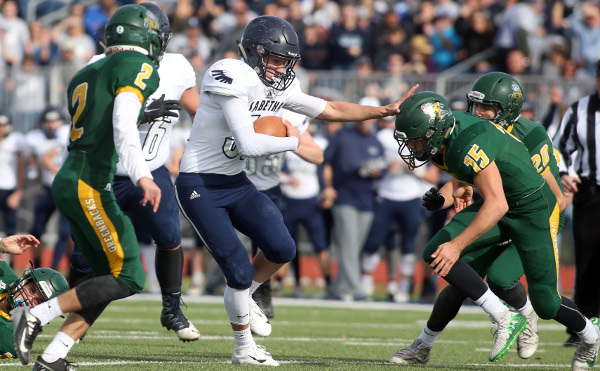 Theis scored on a pair of 9-yard runs in the fourth quarter, the second of those coming with 1:12 left in the game seemingly clinching a state title for the Greenbacks, putting them up 35-28. But Sabetha took advantage of a squib kick by Pratt that set the Bluejays up at their own 49. Garber scrambled for 16 yards on fourth-and-one with 45 seconds left to the Pratt 11 and two plays later hit Stapleton for an 11-yard touchdown pass with 31 seconds left, Braeden Cox's PAT kick — he missed his first two — tying the game at 35-all and forcing overtime. Pratt got the ball first in overtime and Theis needed three carries to score, punching it across from the 1. Garber carried twice to the Pratt 1 before a false start set the Bluejays back. On third-and-6, Garber threw short to a wide-open Joseph Gruber in the end zone. But on fourth down, he rolled left and hit Stapleton for the score. Immediately, Michael kept his offense on the field to go for two. The successful conversion set off a wild celebration on the Sabetha sideline and stands, while all Pratt's players, coaches and fans could do was stare in disbelief that a shot at an undefeated season had ended so close to completion. Sabetha looked like it might run away with things, jumping out to an 18-0 lead. Stapleton returned a fumble 67 yards for a touchdown, coming in between touchdown runs of 9 yards by Gruber and 2 by Garber as the Bluejays threatened to turn it into a runaway blowout. But bottled up the entire first half, Pratt got life when Theis hit Blankenship on a 52-yard pass to set up a 1-yard Theis touchdown run and the Greenbacks carried the momentum over to the second half. Gruber led Sabetha with 156 yards and two touchdowns, the second a tackle-breaking, defender-leaping 48-yard touchdown run that tied things 28-28 in the fourth. Garber ran for 95 yards and threw for 60, while Stapleton accounted for three touchdowns. "Every emotion, every feeling you can think of," Sabetha lineman Elliott Strahm said. "A minute left and they're driving and you think you might lose. Then in overtime fourth down and you might lose again. To pull through, it's just crazy." The same emotions were felt on the opposite sidelines, just with a different feeling at the end. Sabetha —Cox 22 field goal. RUSHING — Sabetha: Gruber 24-156, Garber 19-95, Spellmeier 8-19. Pratt: Theis 35-245, Riner 6-19, Huber 2-17, Blankenship 2-0. PASSING — Sabetha: Garber 7-12-0, 60 yards; Team 0-2-0, 0. Pratt: Theis 5-12-0, 143 yards. RECEIVING — Sabetha: Stapleton 3-18, Cox 2-31, Burger 1-8, Gruber 1-3. Pratt: Blankenship 3-126, Winsor 2-17.